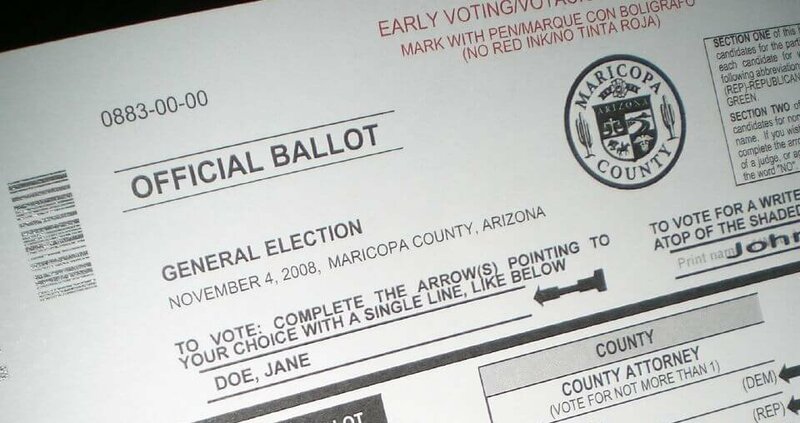 Arizonans could face a use-it-or-lose situation with the Permanent Early Voting List under a bill approved by a Senate committee on Thursday. The Senate Judiciary Committee passed Senate Bill 1188 on a 4-3 party-line vote, with Republicans supporting the measure and Democrats opposing it. Voters who want to automatically receive an early ballot in the mail for every election can sign up for the Permanent Early Voting List. Under SB 1188, anyone who doesn’t vote in either the primary or general elections for two consecutive election cycles would be removed from the list, though they would still be registered to vote. At least that’s what the sponsor’s intent was. The bill may accidentally be much stricter than intended. Sen. Eddie Farnsworth, the committee’s chairman, noted that the language of the bill appears to require that a voter vote in all four elections over the course of two election cycles in order to avoid being removed from the PEVL, as opposed to being removed only if a voter misses all four elections. Farnsworth, R-Gilbert, later said he believed the language could be interpreted to require voting in only one of the four elections, rather than in every one of them. Sen. Michelle Ugenti-Rita, R-Scottsdale, who sponsored the bill, said her intent was to require that someone vote in only one of four elections to remain on the PEVL. She said she’s willing to amend the bill to clarify the issue. There are more than 2.6 million people on the PEVL, according to the Secretary of State’s Office. Nearly 2 million of those voted in the 2018 general election. It is unclear how many people would be removed from the PEVL as a result of SB 1188. Ugenti-Rita said she hasn’t spoken with any election officials about SB 1188 or the issue she’s trying to address. But she said she’s heard anecdotally of people who received ballots for voters who no longer lived at the same address or who had passed away. “Lots of people that I talk with say it’s a problem,” she said. Other Republican members of the committee said they knew or had heard of people who received mail-in ballots for people who no longer lived at their addresses. Sen. Sonny Borrelli, R-Lake Havasu City, said he knows of a couple in Mohave County that died years ago, yet their daughter continually receives their ballots in the mail, regardless of how many times she’s asked county election officials to stop sending them. No one testified in favor of the bill or testified about having received a ballot for a voter who has moved or died. Numerous people testified against the bill. Officials from the Secretary of State’s Office, Maricopa County Recorder’s Office and Arizona Association of Counties opposed the bill, saying they saw no need for it and that pre-existing laws are adequate for removing people from the PEVL. Sen. Andrea Dalessandro, D-Green Valley, said the state informs election officials when a person dies, and that Arizona is part of a multi-state program used to clean up voter rolls when a person registers to vote in a new state. Others said SB 1188 would add a new barrier to voting. If someone expects to receive a ballot in the mail and doesn’t, it could discourage them from voting, several critics said. Sen. Martin Quezada, D-Glendale, said the barrier created by SB 1188 may be small. But multiple small barriers can add up, and that’s where disenfranchisement comes into play, he said. “Whether it’s your intent or not, choosing to be ignorant of those ramifications is irresponsible, and I think it’s bad governance,” said Quezada. Some critics noted that SB 1188 doesn’t require election officials to notify voters before they are removed from the PEVL. Ugenti-Rita said she left that out of the bill to give counties as much flexibility as possible as to how they’ll implement the proposed law, and said nothing would stop counties from reaching out to voters before taking them off the list. Farnsworth said it’s a “fallacy” that the bill will prevent anyone from voting, noting that Arizona allows early voting in person or through the mail, as well as voting in person on Election Day. He said the worst-case scenario for someone who wants to vote after being dropped from the PEVL is that they’ll have to vote in person, and re-register for the early voting list if they want. The next stop for SB 1188 will be a vote of the full Senate. Sponsor Ugenti-Rita’s arguments for SB1188 at this hearing seemed weak and unenthusiastic. Meanwhile, Judic Comm chair Farnsworth came across as the real champion of PEVL purge, repeatedly challenging and attempting to repudiate anyone who spoke in opposition. On more than one occasion he cut off, talked over and argued with people who were simply trying to put forth their positions. Sen. Farnsworth’s behavior was improper and unfair to SB1188 opponents. More should be expected of committee chairs. In Maricopa County, and I suspect in the other counties as well, a ballot mailed to a voter who has moved and who has not updated their address is of no consequence. If someone other than the intended recipient attempts to fill out that ballot and mail it in, it would be caught, investigated, and discarded. Signatures have to be present on the mail back envelope and those signatures must match what’s on your voter registration form. Like all Republican efforts to rob us of our right to vote, this attempt is based upon falsehood.